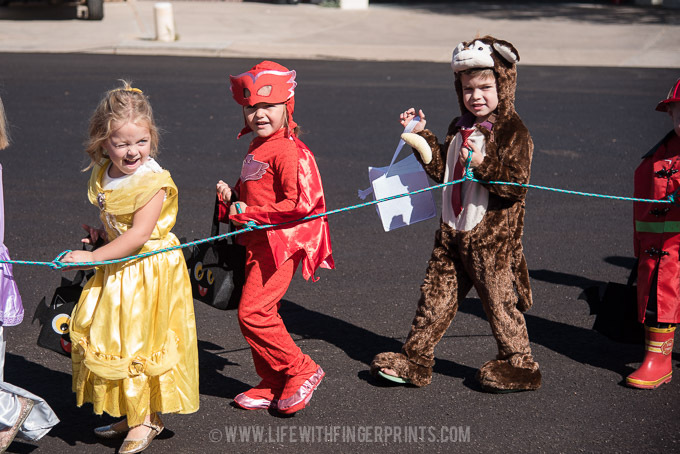 Halloween morning started with the elementary school parade followed by the preschool parade. I ran into this rowdy bunch and Hunter wanted nothing morning than for Briggs to come sit with him and yet Briggs refused for the longest time! He eventually warmed up! 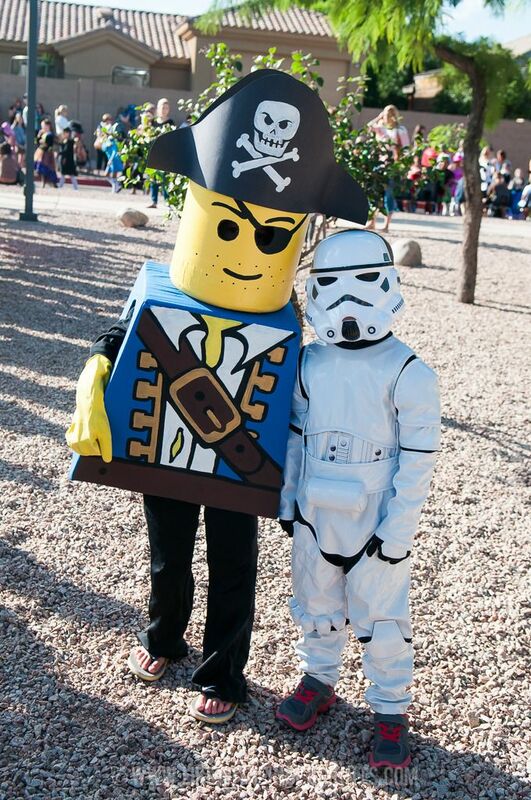 Cannon wanted his kart for the parade but the preschool asked that we don’t send any removable parts to costumes. 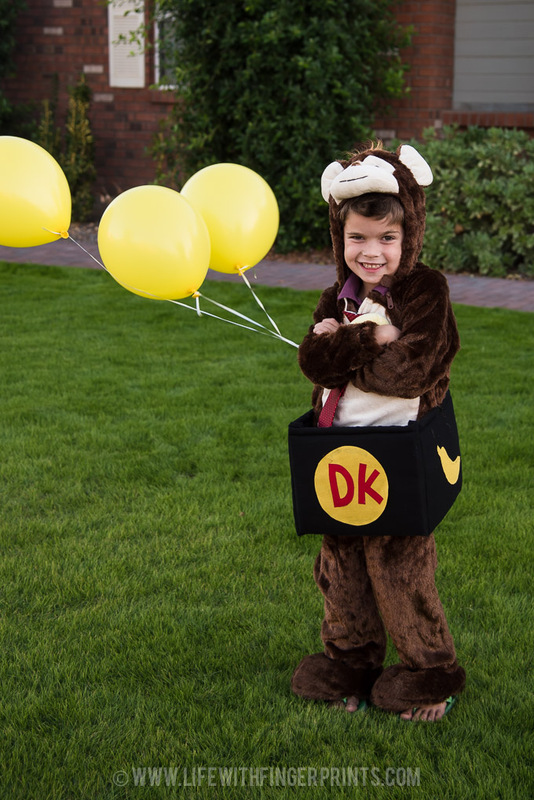 So he was a just Donkey Kong. 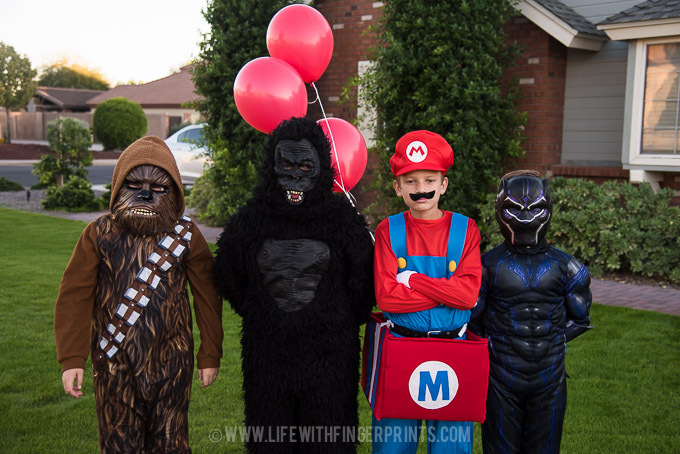 Each kid was in heaven as they spent the evening trick or treating with their friends. Trying to get 4 two and three year olds to look at a camera when they’ve got candy in their mouth proved to be difficult. This is the best we got – but I still love it! These two are so fun together – they would choose to play every day if they could – and some weeks they do. Somehow in the midst of our neighborhood dinner I missed a picture of Bennett with his buddies – but I got Hunter. 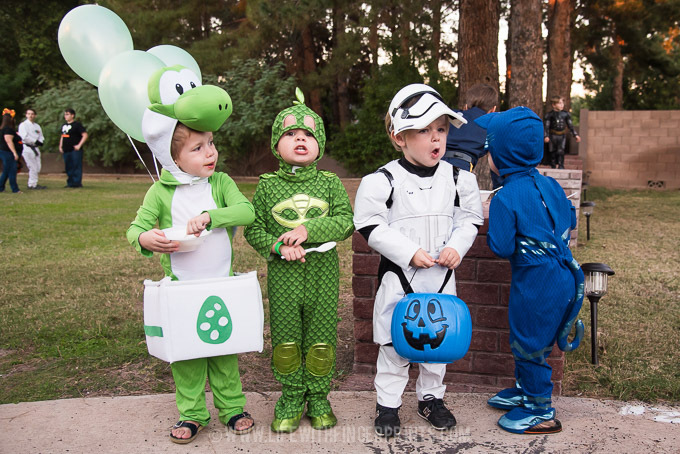 And he takes the cake for the most kids trick or treating in a group. 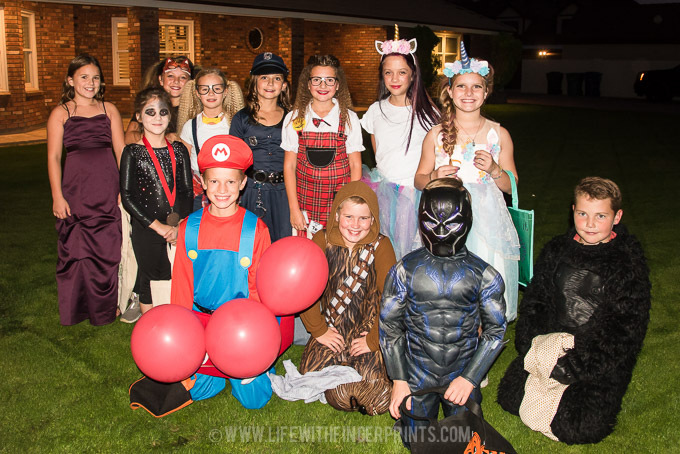 These boys were smart when they asked Hunter if they could trick or treat in our neighborhood – look at all those girls! They were quite the pack. 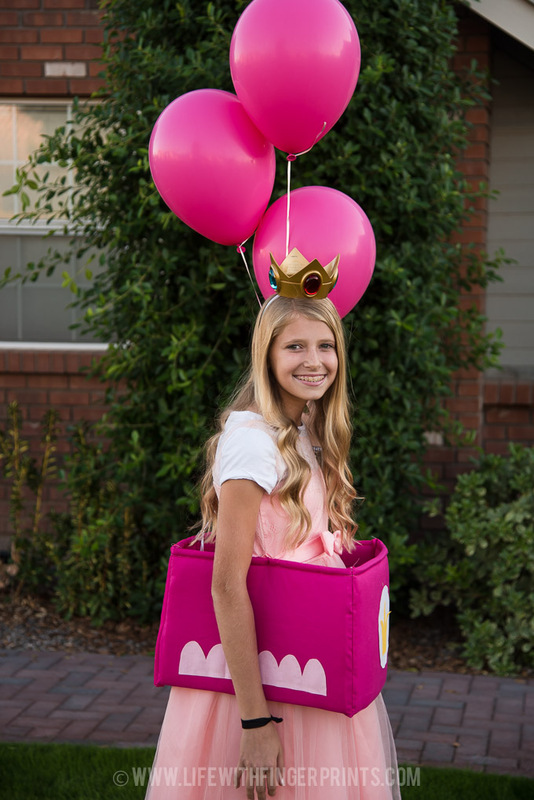 Hallie is at the stage where she still likes to dress up and trick or treat a little – but she also has fun taking the younger kids around. She’s helpful to have around! 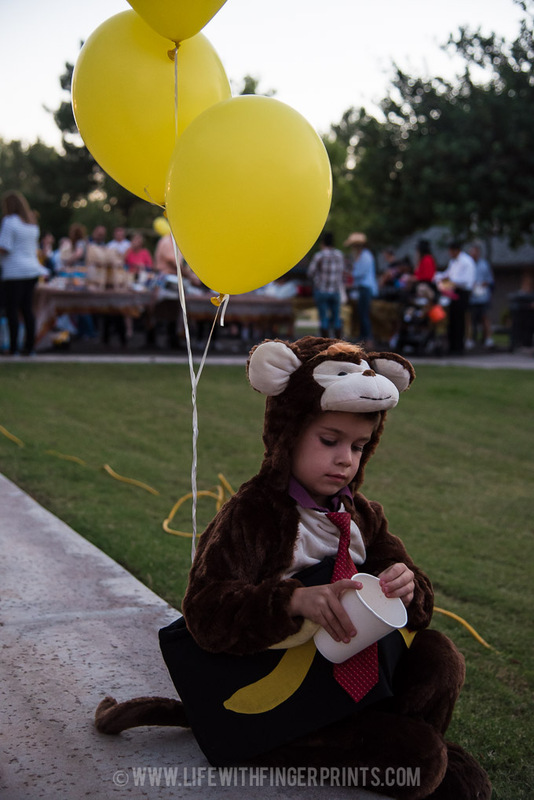 And after a successful evening we had kids lining our porch dumping out candy and trading – isn’t that the best part of the night?! 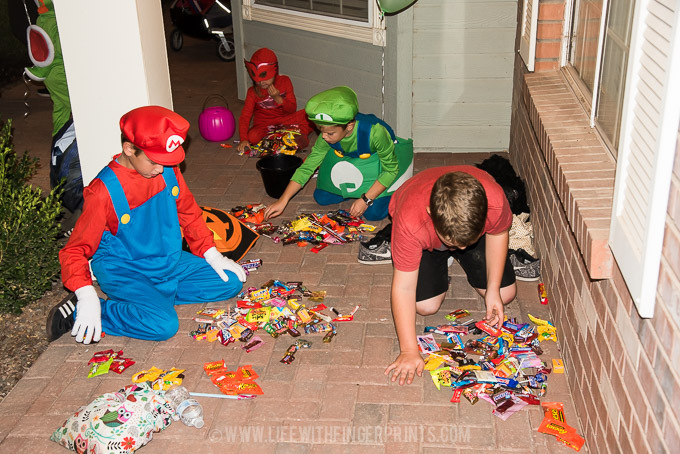 I hate all the candy – but I love the excitement and energy. 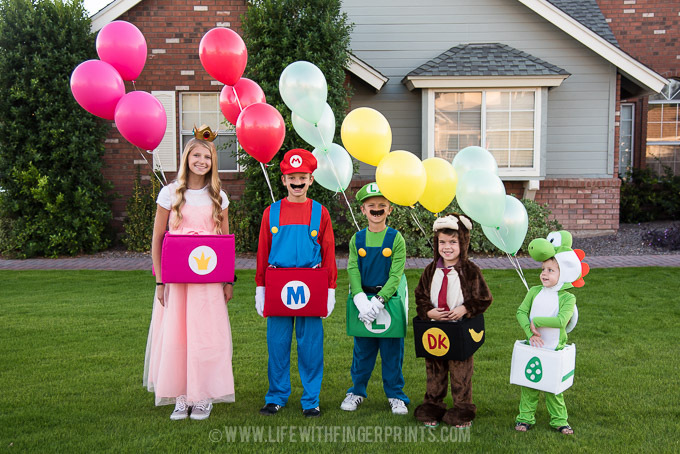 This years’s costumes are brought to you by Nintendo Mario Kart: Bowser, Toad, Princess Peach, Mario, Luigi, Donkey Kong and Yoshi. 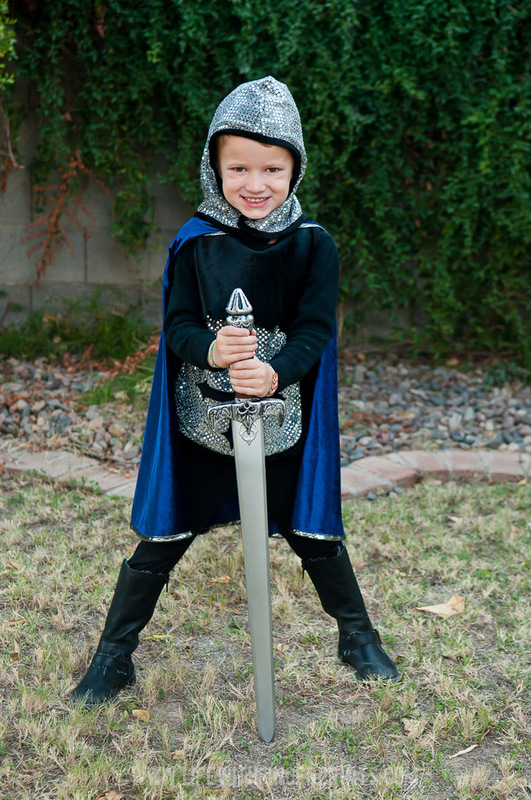 Steve tried putting costumes on the chopping block this year, which was understandable. We’ve had to simplify many things in lieu of the home renovation but this was not something the kids (and me) were ready to give up. 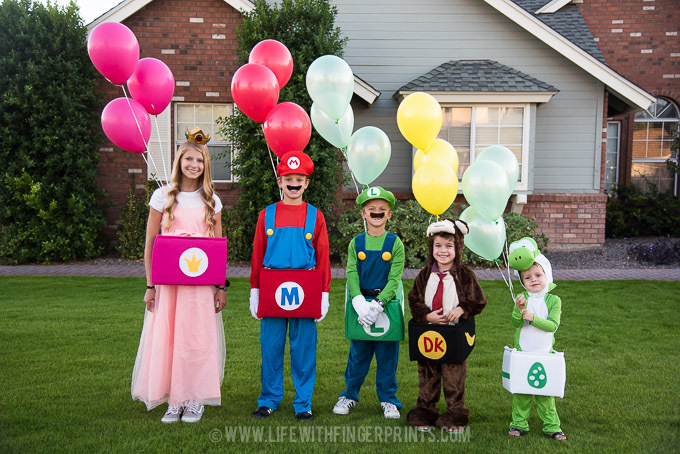 However, this project was simplified by buying several costumes and then just making the boxes/karts. 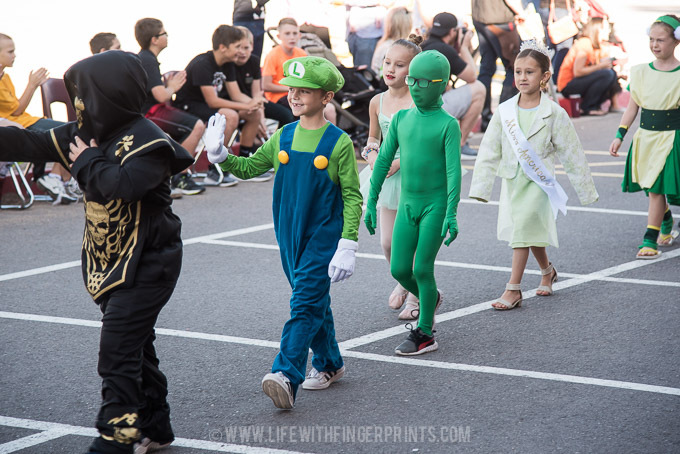 Each kid chose their character and as usual – I was left with whatever character wasn’t chosen – poor Toad! 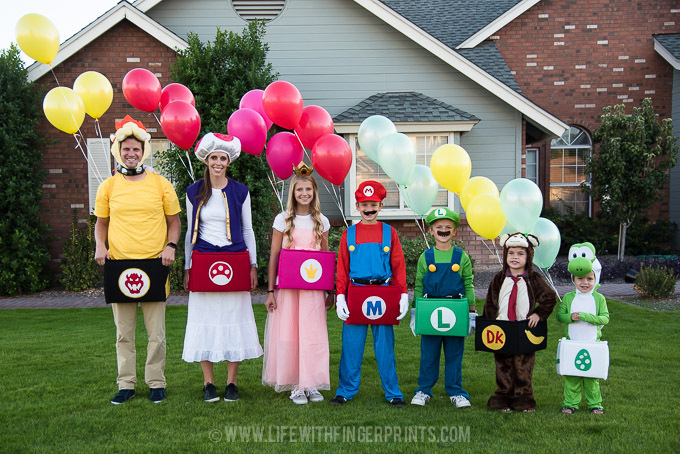 Every year I say this – but every year it’s true – I’m not sure how much longer they’re going to be willing to do a family costume! People ask how in the world everyone agrees. We sit down and throw out ideas. 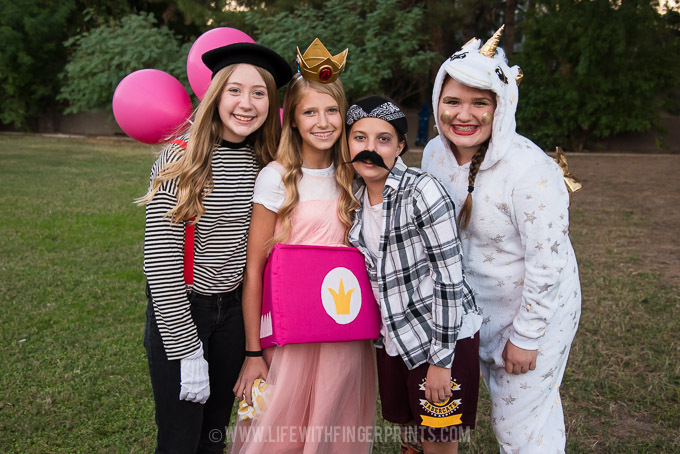 We do some research and see if there’s enough costumes for 7 people – there’s usually three great ideas that we’re choosing between. 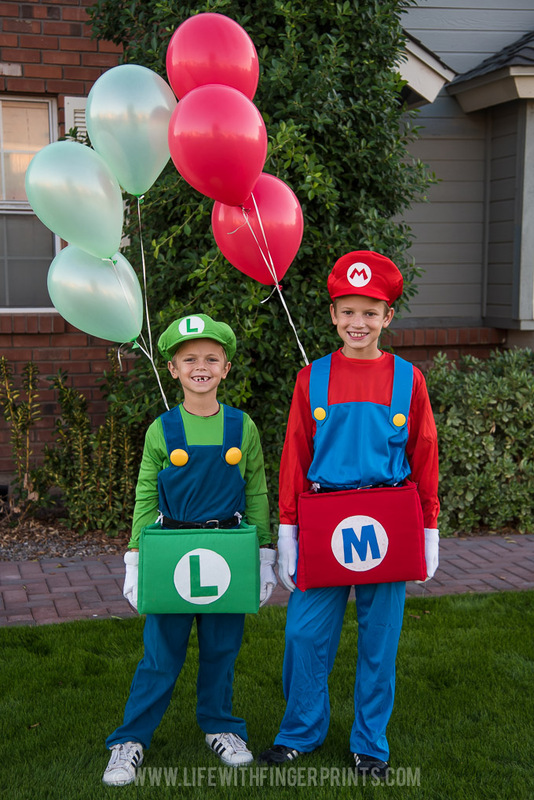 The kids then decide which costume they would be in each theme and then we talk it out and some people are more vocal in swaying people to their idea. 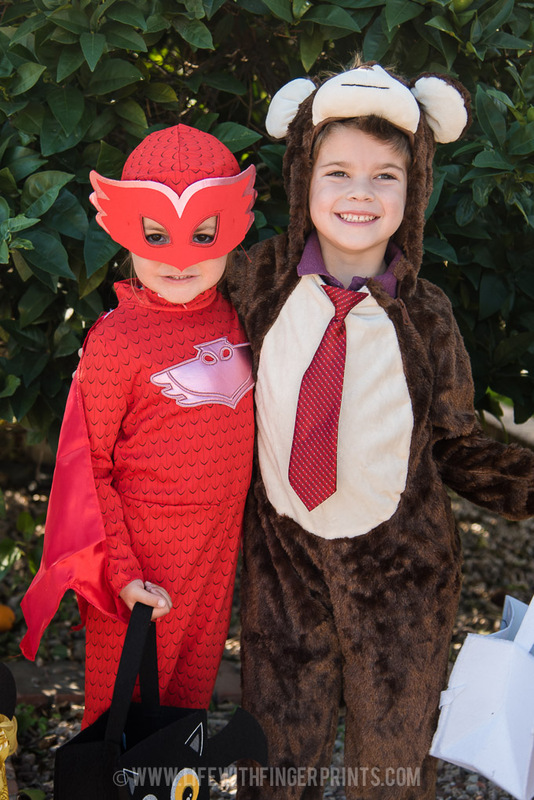 (As you can imagine, Steve would prefer no costumes at all but he is such a good sport and goes along with the fun!) And then this happens: Seven people in coordinating costumes. 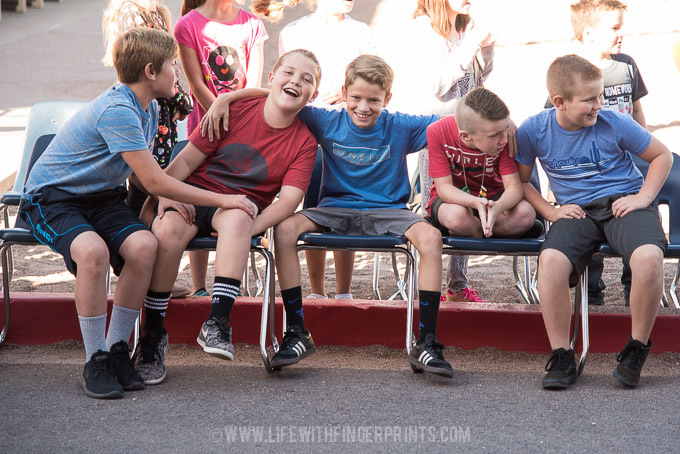 Its fun and they all look forward to it…for now. We’ll see how it goes next year! We had a beautiful day. 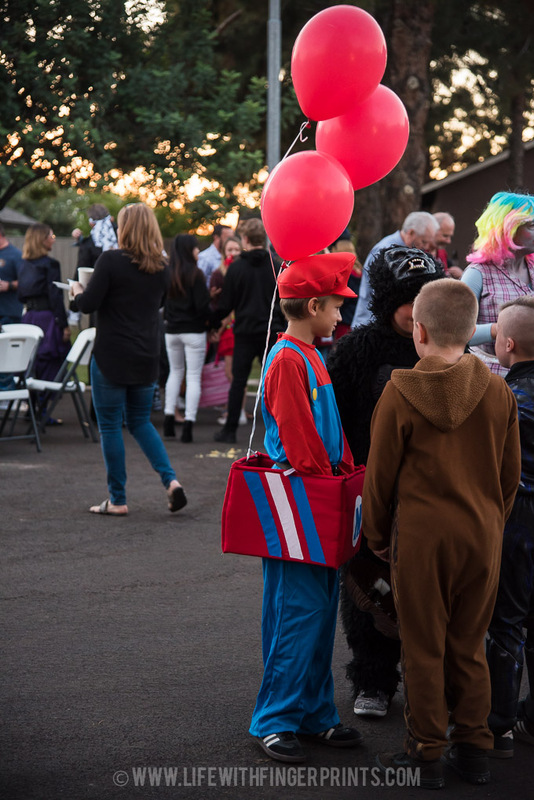 We spent the morning jumping from one Halloween parade to the next and then we gathered with our neighborhood and friends this evening to celebrate. This picture tells how Briggs felt about it. 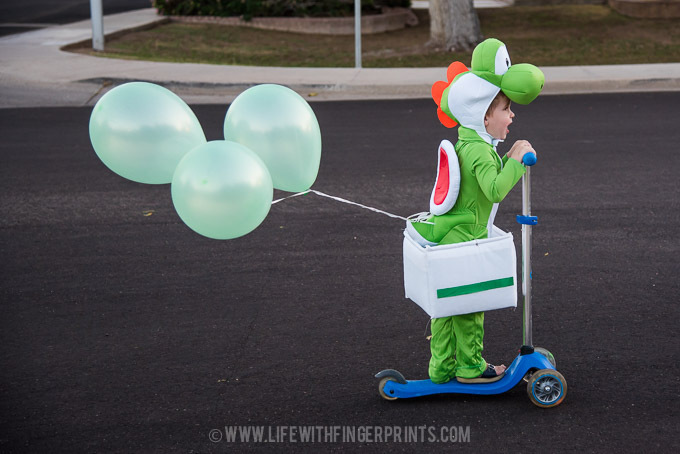 Our little Yoshi go-cart cruised around on his scooter with balloons trailing behind him and he couldn’t have been more happy. He’s finally old enough that his little legs could handle walking/scooting the whole time. I pushed an empty scooter all night – I was sure he was going to putter out, but he proved me wrong. 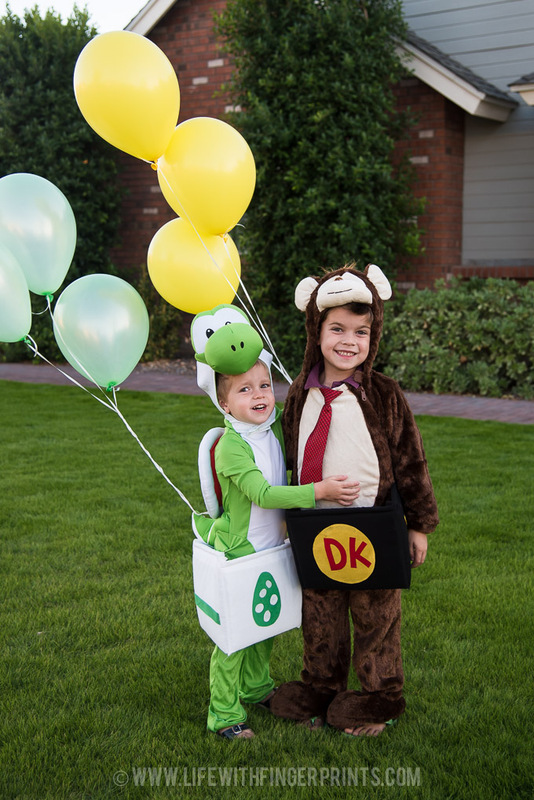 I know Halloween is low on many people’s holiday list – but I love it (minus the candy!). We are in our prime weather season so walking around during a beautiful evening is welcomed. Sharing that walk with friends is even better. Then we show up to all our neighbor’s houses and every house is a welcome and happy greeting. What’s not to love?! Steve and I sat on the couch (which are pushed extremely close together while we continue working on the house), with costumes and candy wrappers littering the floor and wondered how in the world it’s already November?? Our fall has blown past us and with Halloween behind us, we’re in full blown “holiday” season. Can’t we just have another October? Is that too much to ask? Sidenote: We picked up this Globber scooter (aff) on clearance after last Christmas and gave it to Briggs for his birthday. He was turning two and maybe a little young to figure it out, even though it has three wheels and much easier than the razor scooters (although Cannon has loved it and used it a lot). About a month ago – he finally figured it out and he now loves it. It’s so funny to watch his little legs push along, so low to the ground. It makes me think he’s ready for the balance bike! 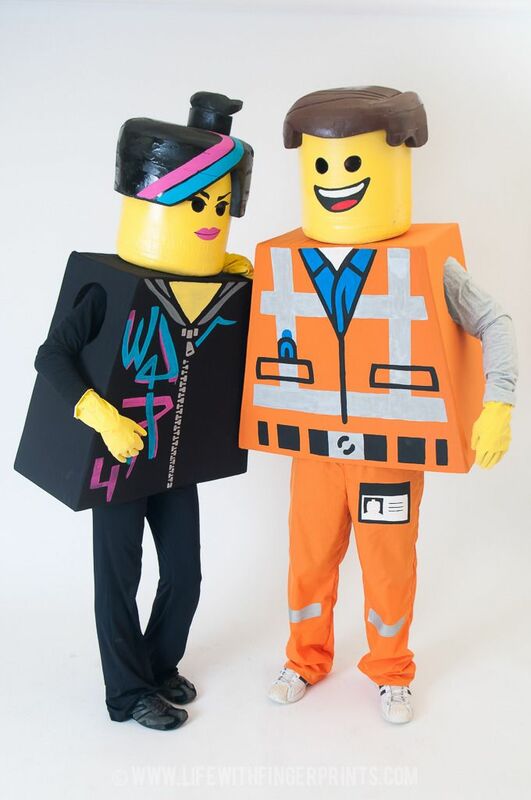 I have several favorite costumes, but our family lego costumes are at the very top of my list. Favorite of all time. Hands down. 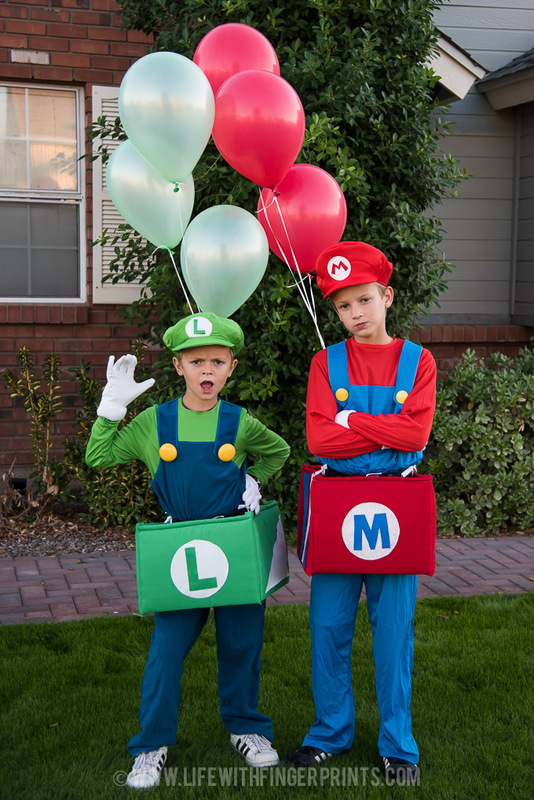 It might be a direct correlation to how much time I spent making those costumes, but a favorite indeed. 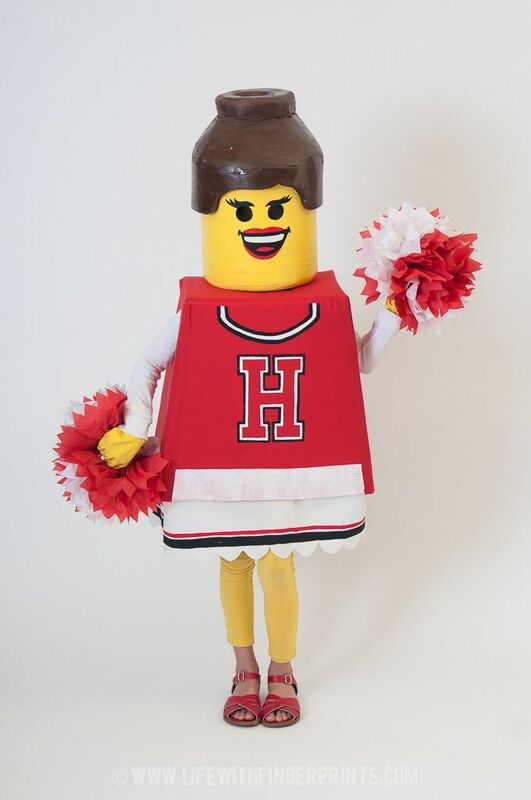 Perhaps we need to pull them out again some year – the only problem is we’ve had another kid and I’m not about to make another Lego costume! 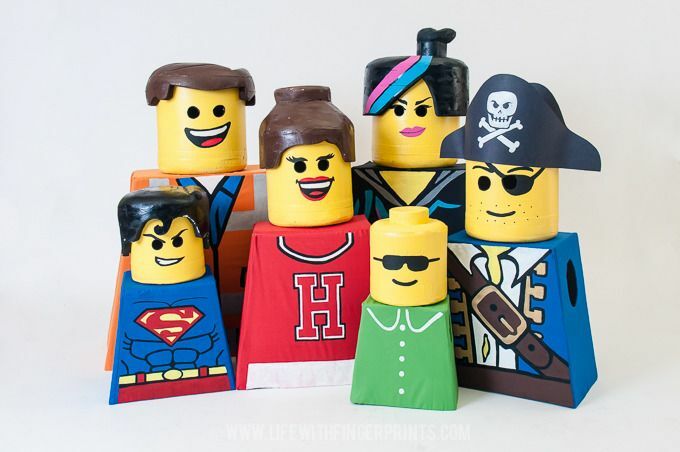 See how I made the Lego heads here. 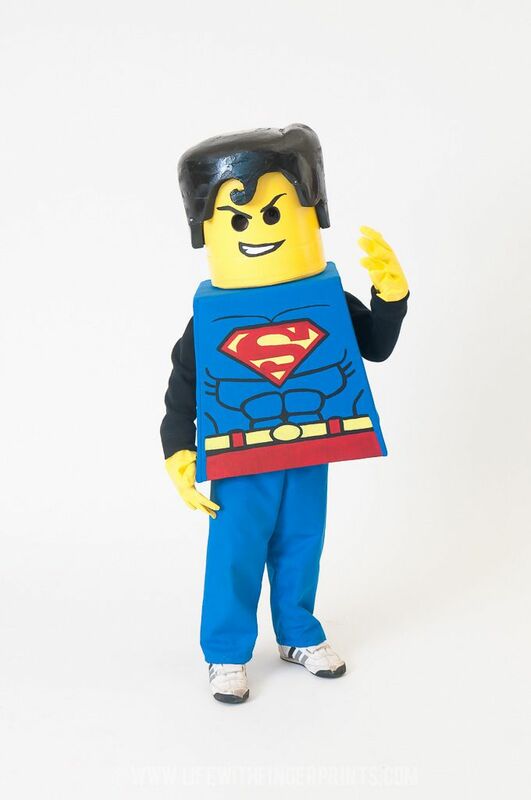 The Lego costumes had bodies were made from cardboard, large furniture boxes. 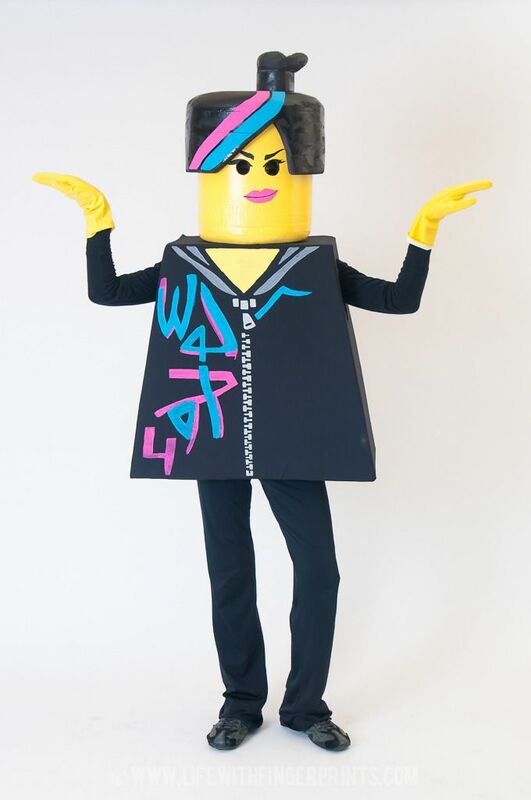 I measured a lego mini figure and proportionally made measurements based on everyone’s height to create a pattern. They were cut out using my jigsaw (yes, I used a saw for cardboard – it’s what I’m comfortable with!) and taped together on the inside and the outside using Gorilla tape. I first tried duct tape but it didn’t stick to the cardboard like the Gorilla tape did. I initially thought I would quick spray paint all the bodies. But a trial run left me with undesirable results. The paint soaked into the cardboard and all you could see was the tape on the edges. 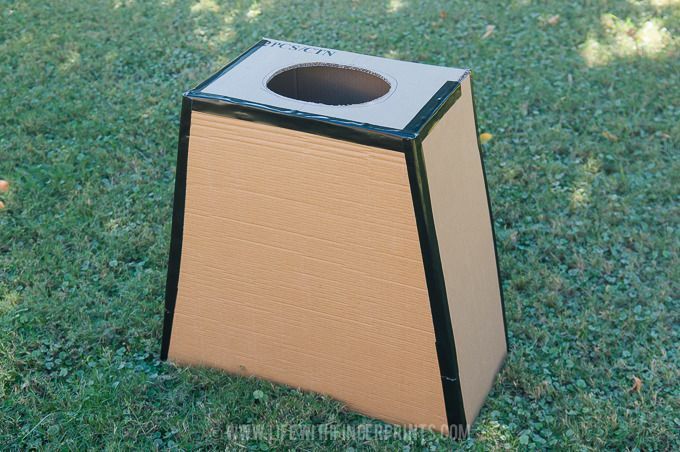 Plan B: Cover the cardboard in fabric and paint the design on the fabric. Plan C: skip the bodies all together and wear clothing that represents the bodies. I was determined to make plan B work. I didn’t think covering the boxes in fabric would be extremely difficult. However, I’m not a seamstress and I basically had to create slipcovers for each box with odd angles. 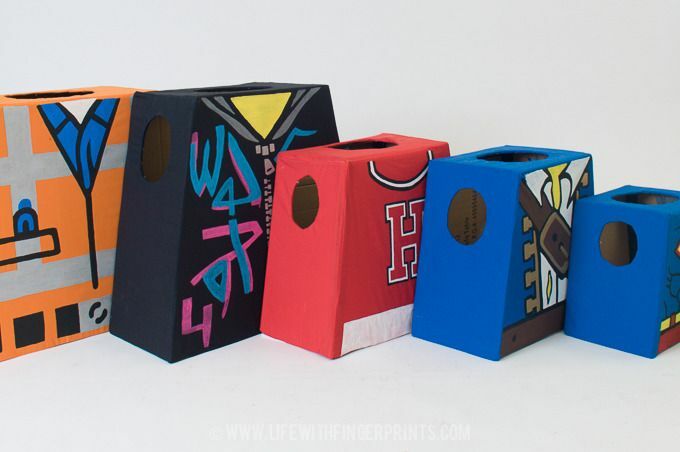 The results were a long shot from being perfect but they were 100% better than plan A and still better than plan C.
With fabric covered boxes, I used our video projector showing lego guys to trace designs on the boxes. 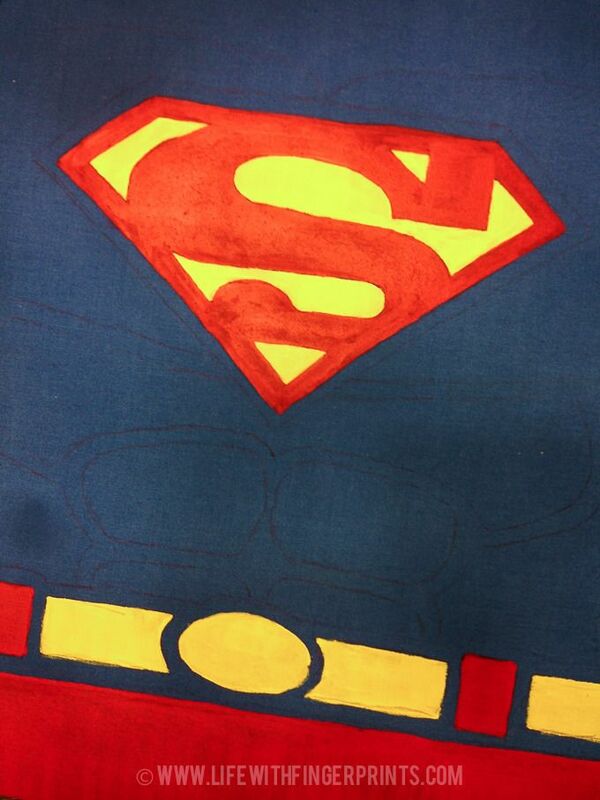 I then went to work painting each design with craft paint. This was probably my favorite step out of the whole project. I remember Steve was out of the country the week before Halloween and all I had was cardboard box bodies somewhat put together before he left. 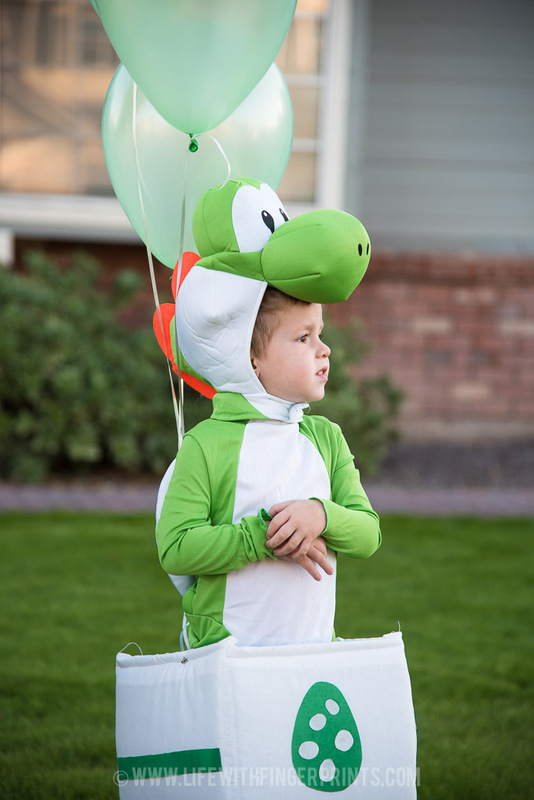 As I painted late into each night he was gone, I saw the costumes coming together and it made excited. Each detail I painted added to authenticity and it wasn’t the chore I thought it would be. The task was more than rewarding and I watched some great movies in the process. My mom came into town while Steve was gone and was with me while I painted a few of the bodies. She shook her head in disbelief that I was spending as much time as I was on each body. And although the word “crazy” escaped her lips more than once in describing the process (or perhaps referring to me in general) she pitched in and helped me out. 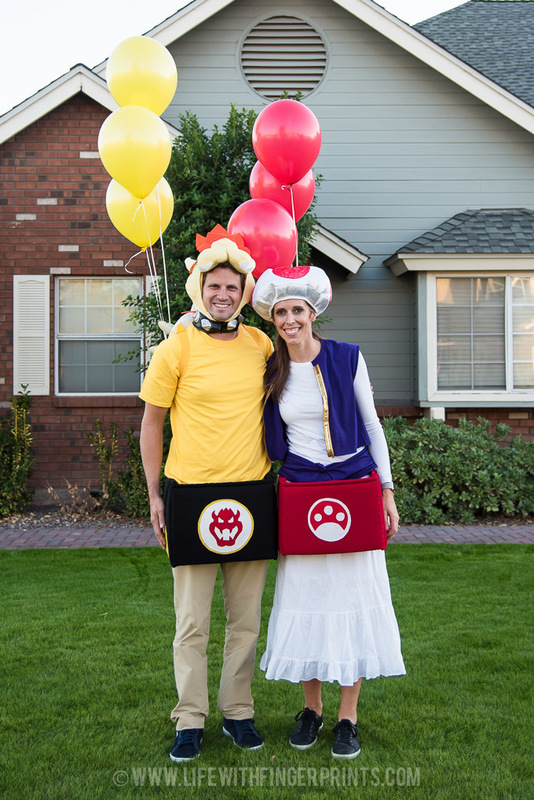 Two of the costumes needed some pants to go with their bodies – and she sat at the sewing machine and whipped them out. Where was she when I was covering the boxes?! By the time Steve arrived home just in time for Halloween, he was amazed by the finished product. The kids continually tried them on and loved them. The bodies and the heads sat on our dining room table in hopes of not being ruined before the big day and everyone that came to our house and saw them could not wait to see them in action. Just about everywhere we went – we were celebrities – we took a lot of pictures with random people. It was a fun night. After Halloween was over they sat back on the dining room table until I could figure out what to do with them. I have high hopes of wearing them again someday – so they carefully sit wrapped in garbage bags in the attic awaiting to make their grand re-entrance! 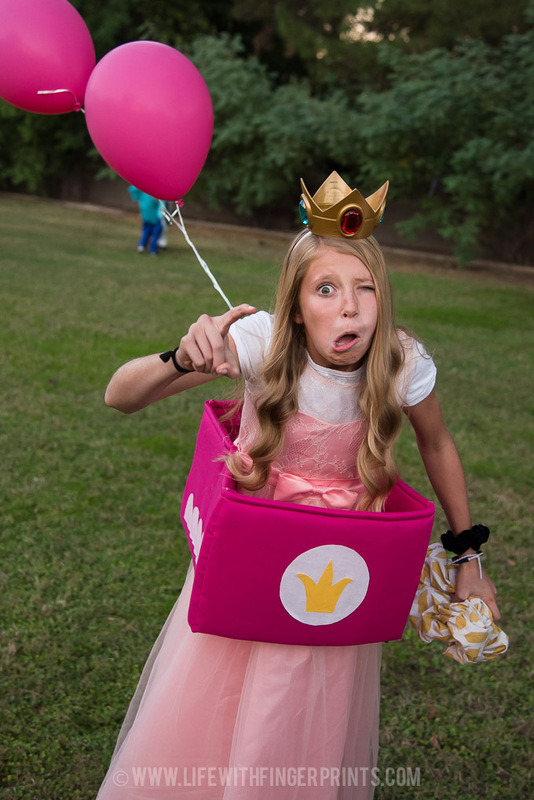 My love for Halloween costumes is apparent. For the last 5 years, I’ve made the costumes for the most part, but that’s not how it started out. 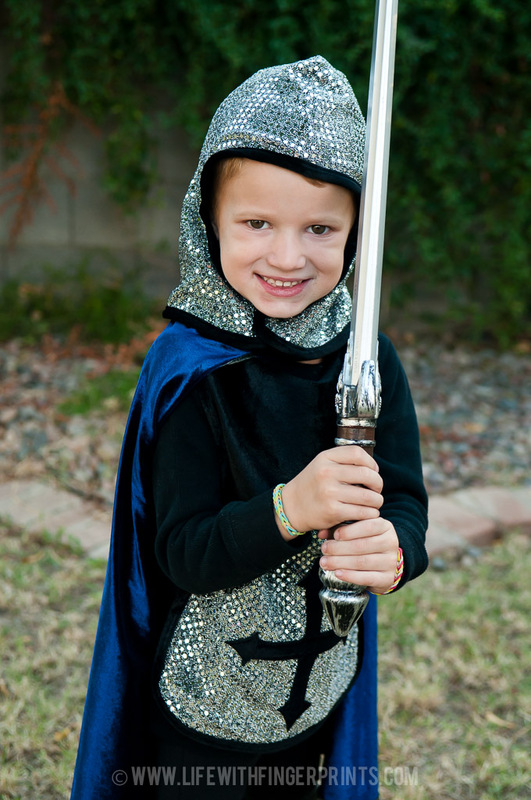 In fact, for many years the costumes were all purchased and my favorites were always from Pottery Barn kids. I worked there and waited until the end of the season and then snatched up all the best deals with my employee discount. I bought many years in advance and had many options in the same size. (I was picking them up for less than $10 a piece and I knew they’d get good use). 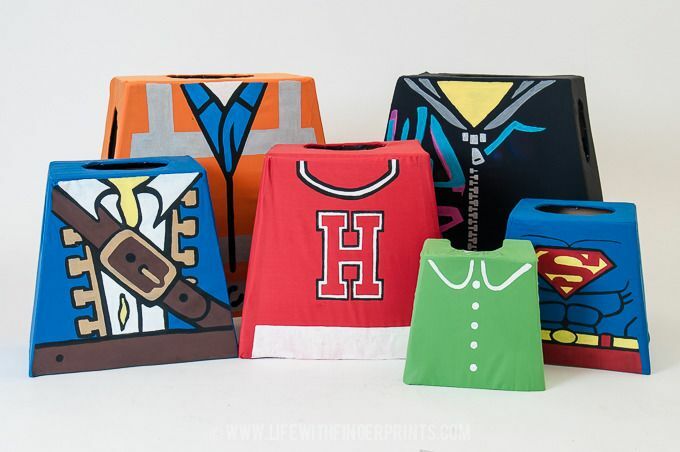 So for several years after I quit working there we had costumes all lined up and then my kids kept growing and we needed costumes and that’s when I started making them. 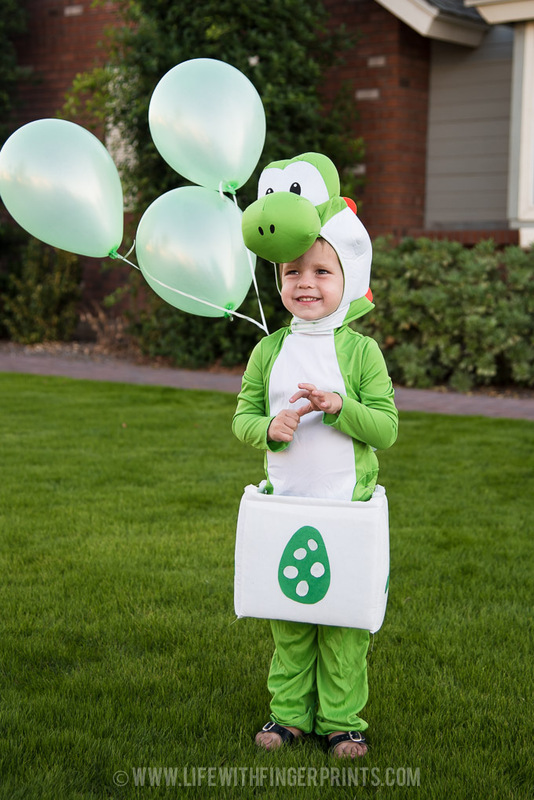 But if I’m being honest, some of those Pottery Barn Kids costumes are still my favorites (in fact Briggs’ blue fish costume last year was Pottery Barn Kids purchased on ebay). 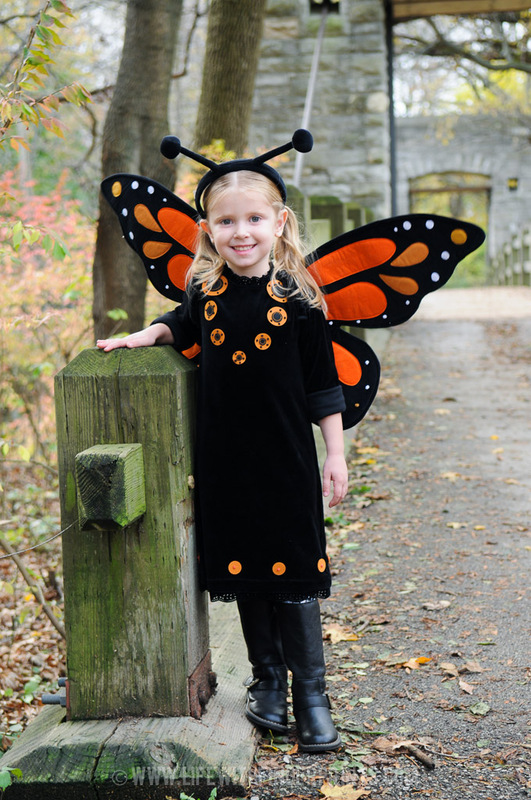 Hunter’s Knight and Hallie’s Monarch butterfly are on my favorite’s list. They are extremely well made and I love the details – and they’re always comfortable which is high on the list of importance for kids. Side note: Last year I was cleaning up the Halloween box when I was putting everything away and I went through all the costumes. 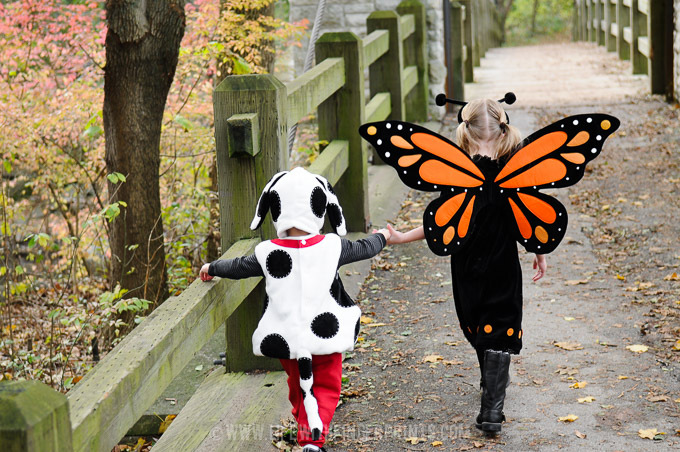 I don’t have another child that will ever where that monarch butterfly but I couldn’t part with it. I loved it too much!